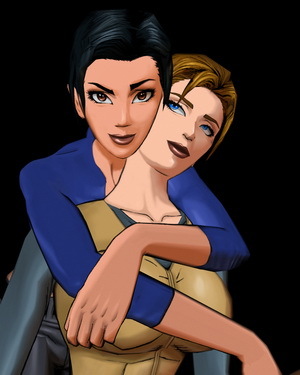 Fear Effect 2 features a heavily implied, if not explicitly stated, relationship between the main player-character Hana Tsu-Vachel and her partner Rain Qin. Hana is a French-Chinese freelancer for the Traid. Rain is hacker who has no memory of her past. Their relationship, according to this review, was only a small part of the overarching game story. The ads for the game however, like the one pictured below, hinted at a much more explicit relationship than what is shown in the game. One of the rare moments in which their relationship is more than hinted at appears in the video below. It is important to note that in the original game, Hana’s partner and male love interest is another mercenary, Glas Royce. Stan Liu, the President/CEO of Kronos Digital Entertainment and the writer/director of Fear Effect, says explicitly in one interview that Hana is bisexual. He also states that their relationship was meant to be “closer to Xena and Gabrielle” rather than “Thelma and Louise.” It was not a main part of the story, and “The only reason I wanted Hana to have a female companion this time around is because it gives me the ability to create an extremely interesting love triangle further down the road” (Lui, 2001). In 2018’s Fear Effect Sedna, the two are shown very clearly as being in a relationship. Zoomin. TV Games. (2013, September 5). Retro game of the week- Fear Effect 2: Retro Helix (PSX). YouTube. Zoomin. TV Games. (2013, April 5).